Celtic boss Neil Lennon should delay ambitions to manage in England in order to secure a domestic treble, according to Robert Snodgrass. Scotland and Norwich City midfielder Snodgrass, 26, was addressing Lennon being linked with the English Premier League outfit. However, he believes Lennon should aim for a domestic clean sweep before deciding his next move. "I'm a Celtic fan... so I'd like to see him try to get the treble," he said. Lennon, who has secured three consecutive league titles, two Scottish Cups and a last-16 Champions League place during his Celtic tenure, has been linked with Norwich. Neil Adams was installed at Carrow Road following Chris Hughton's dismissal as they aim to secure Premier League safety. "The Celtic lads have great things to say about him so if that is what he is wanting [work in England] then good luck to him," said Snodgrass. "But [with] the manager in charge now, even though we are not getting results, we are playing well in certain spells. "It will be interesting to see who does get the job. I'm sure Neil Adams will put his name in the hat and push his own claim. "I will let the powers that be upstairs decide that. But I'm a Celtic fan so I would like to see him trying to do better in the Champions League [group] stage and try to get the treble." Speaking on the BBC's Match of the Day 2 earlier this month, Lennon said he was "flattered" to be linked with a move to England. Celtic full-back Adam Matthews is also hoping Lennon sticks with the Scottish champions. "I haven't heard that much really. We hope he stays, he's been brilliant for Celtic and for us as a team," said the Welshman. "If he does go it will be a big blow, but fingers crossed he stays." 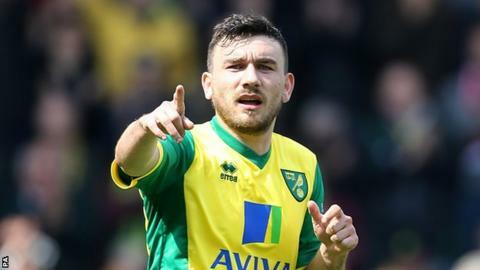 Snodgrass has been linked with a move to boyhood heroes Celtic but insists his focus is saving Norwich from relegation. "There is always going to be lots of talk. Celtic are a massive club but I have a job to do for Norwich and I will focus every bit of my effort trying to keep Norwich in the league," he said. "If the worst comes to the worst and you look back with any regret, or if you could have done more, then I won't be able to live with myself. "We have had very tough games over the last few weeks and it doesn't get any easier with Chelsea and Arsenal coming up. "But I am relishing the challenge and hopefully we can do it. "You must be doing something right if you are being linked with a club like Celtic. "But I have another year left at Norwich and I will give everything I have got in my body for that club because they have been terrific with me. "They gave me my chance to play in the Premier League so I will honour that."